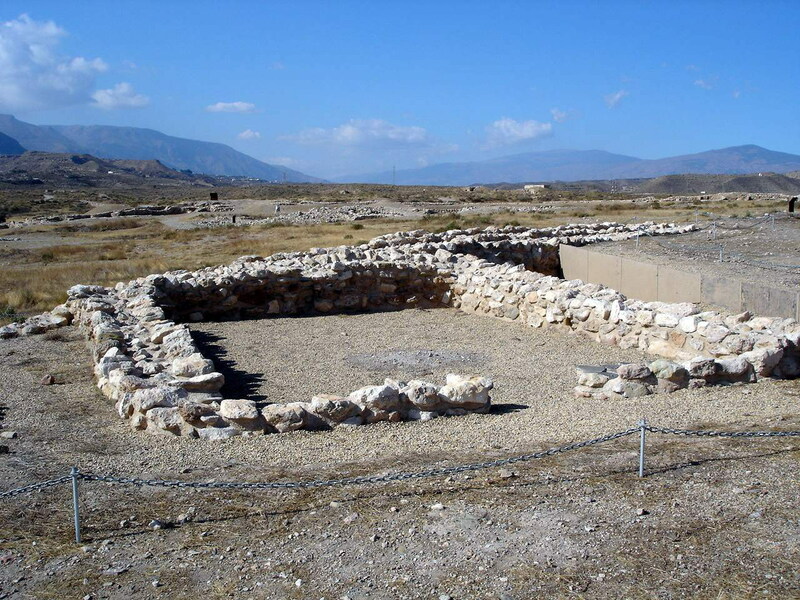 Why do these remains appear in a set of web pages devoted to Almerian Industrial Archaeology? 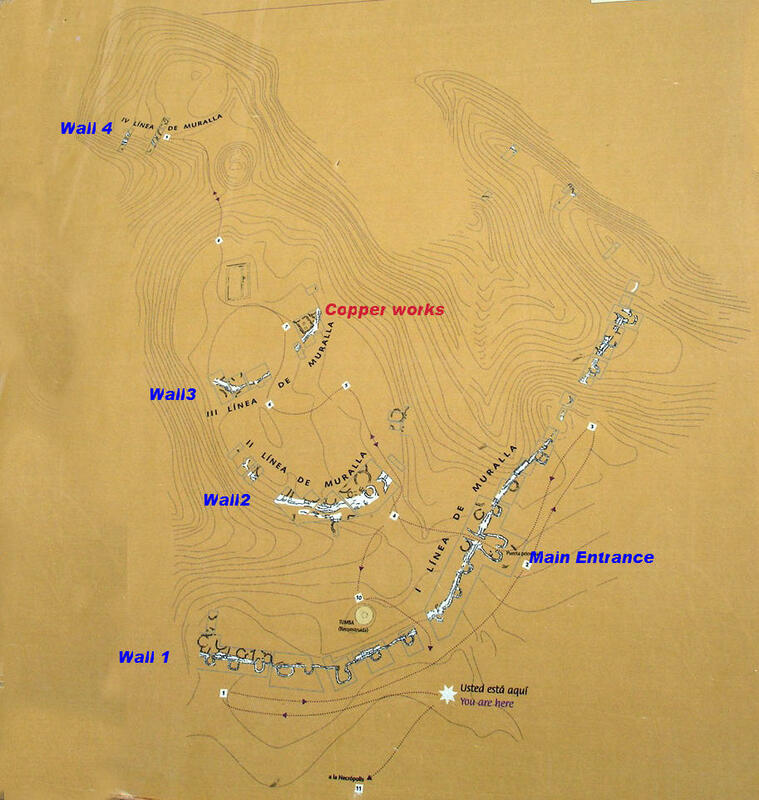 The answer is that there is a well-preserved copper smelting works on the site. Constructed around 3000 years BC, they must be one of the oldest examples of IA in Spain, unless you include flint knapping! I have not tried to include a detailed explanation of the site as it is outside my self-imposed remit and in any case a look on any search engine will produce many good descriptions. However, to give a flavour of this large and important site, I include some pictures that I took on my visit there. The pictures below show two general plans of the site. The first is a general schematic. Below that is a plan showing contours and location of the major remains. Occupation started at the top and worked it way downwards as the site expanded. The description is taken from some of the information boards placed around the site. Three successive lines of walls protect the settlement at Los Millares. They divide the settlement into distinct sectors. There is a fourth square fortification in the form of a "citadel", which occupies the easternmost end of the spur. The outer wall (Line 1), was clearly built to accommodate an increasing population in the village. It stretches some 400 metres from its northernmost extreme at the top of the scarp above the Andrax valley to its southernmost point, where it reaches the cliff above the Rambla de Huéchar and turns to run parallel to it. This wall is on average about two metres thick, its bulk having been added to over the years by various reinforcements built up against the interior face of the original construction. Along the wall at regular intervals there is a series of bastions and towers, 17 of which have been identified to date, plus two fortified barbican gates allowing entrance to the settlement. The second wall (Line 11) crosses a natural gully and surrounds the central plateau of the village. It was in use throughout the whole period of occupation and is very complex in design, as successive reinforcements and reconstructions have hidden to some extent its original course. The third wall (Line 111) encompasses the innermost area of the central plateau, within which there was a large square building described by Louis Siret in the XIX century but as yet unexcavated. It is thought that this building may have had some sort of public function. This third inner wall existed for a relatively short period before being demolished and replaced by houses. Finally, the fortified citadel at the very end of the spur (Line IV) has only been investigated so far by means of various pilot trenches, which have revealed walls up to six metres thick, confirming the great importance of the structure. Within its grounds there is a deep hollow, which Siret concluded must be a water cistern but so far has not been excavated. The layout of the village was highly organised, with circular dwellings of different sizes, confined to distinct areas of the settlement. 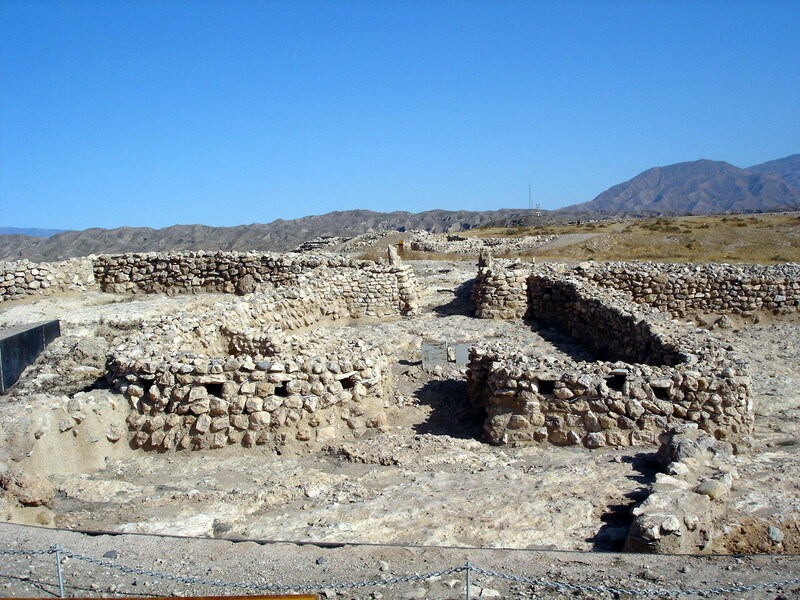 There are various outstanding structures that were clearly devoted to communal use or public business, such as the large square building and the metal-workers' shops inside the third wall and the cistern in the citadel. Siret also records a water conduit, which crossed the plateau through the necropolis, passed under the walls and arrived at the innermost area of the village. All these walls underwent various processes of restructuring during their lifetimes as a consequence of continuous changes in defensive strategy including phases with simple bastions and towers, and others when these structures were made pyriform (pear shaped) and jutted outwards considerably from the wall. At other times ditches were dug around the walls and the village was only accessible via narrow pathways. The strategic sequence of the site shows that the settlement went through various phases of occupation. The first was during the early copper age (3,200 to 2,800 B.C.) when the three interior walls were constructed. The second was during the middle copper age (2,800 to 2,450 B.C. ), when the innermost wall was demolished and the outer wall constructed, together with most of the small forts outside the settlement itself. Finally, in the late copper age (2,450 to 2,250 B.C.) the first bell beakers appeared, a form of pottery that was produced henceforth on a large scale in the village. During this late period some profound social upheaval brought about a gradual decline in the size of the settlement, whose inhabitants gradually retired towards the fortified citadel. 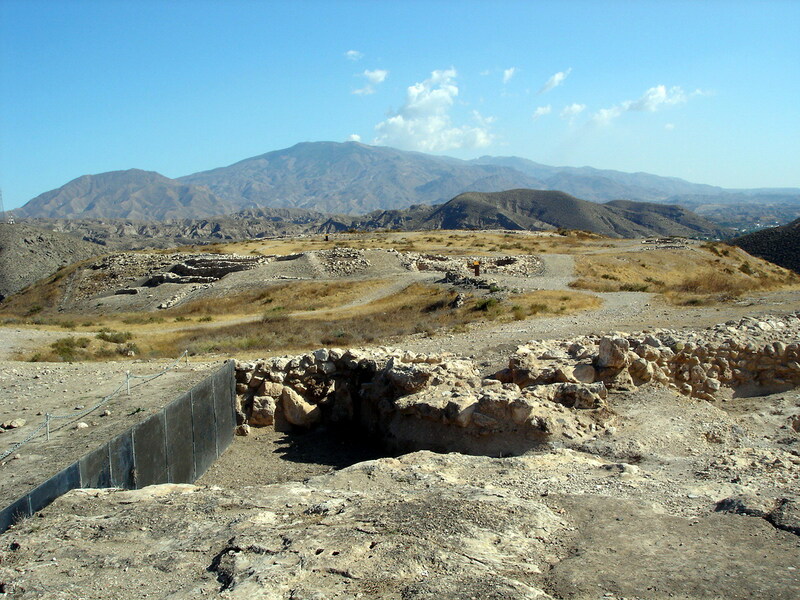 The site appears to have been finally abandoned around 2,250 B.C., much at the same time as new settlements belonging to the Argar culture were appearing in the region. Below is a picture of the main entrance. In the background is a view towards the earlier walls. 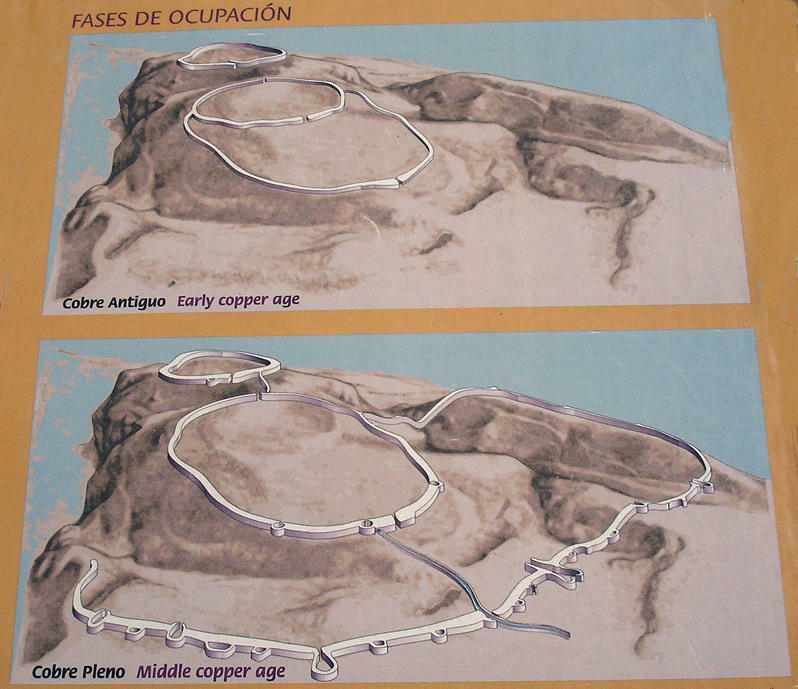 The picture on the right is taken further up the defensive hill, level with the copper works. The line of the earliest settlement and its defensive position can clearly be seen. 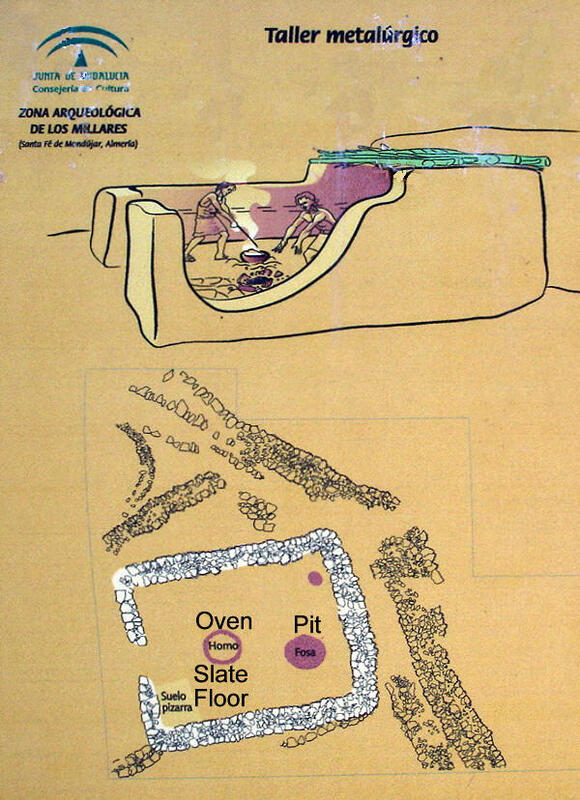 Above is a plan and a picture of the copper workshop. It is 8 by 6.5 metres in size with solid stone foundations, possibly without a roof. The central smelting area shows up clearly in the picture as does the slate floor. The pit at the rear may have been to stand the crucibles in, while cooling.